Vernon “Bud” Slabaugh, 86, of Syracuse, passed away on January 18, 2018 at his home. He was born on December 29, 1931 in Elkhart County to Neal & Fannie (Hochstetler) Slabaugh. On June 30, 1957 he married Bette Mollenhour who survives. He was a US Army veteran. He founded Buds Body Shop in 1958 and operated the business until his retirement. 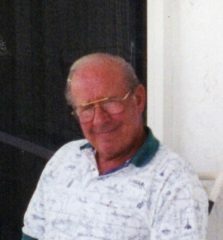 He was a lifelong area resident, wintering in Siesta Key for the last 30 years. He attended the Calvary United Methodist Church, as well as the Siesta Key Chapel. He was a life member of the VFW, and a charter member of Max Welton Golf Club. Bud is survived by his wife of 60 years Bette Slabaugh of Syracuse. 3 sons – Brian (Kathy) Slabaugh of North Webster, Mike (Linda) Slabaugh of Syracuse, and Steve (Jeanetta) Slabaugh of Syracuse. 7 grandchildren – David (Emily) Slabaugh of South Carolina, Cassandra (Brian) Russo of Florida, Doug Slabaugh of Leesburg, Megan (Bill) Dues of Leesburg, Jennifer Slabaugh of North Webster, Benjamin Slabaugh of North Webster, and Jered Slabaugh of Syracuse. 6 great-grandchildren – Piper Kern, Ella Slabaugh, Elliott Russo, Willow Dues, Everly Slabaugh, and Amelia Russo. 3 brothers – Paul (Janet) Slabaugh of Jimtown, Willard (Joy) Slabaugh of Wakarusa, and Jerry (Penny) Slabaugh of Nappanee. 4 sisters – Rosemary Maust of Goshen, Judy Hochstedler of Nappanee, Shirley (Frank) Shoup of Ohio, and Linda Slabaugh of Elkhart. He was preceded by 1 brother Levi Slabaugh, and 1 sister – Katherine Lederman. A memorial service will be held on Saturday, January 27, 2018 at 12 PM at the Eastlund Funeral Home with Pastor David Henry officiating. Calling will be 2 hours prior from 10 – noon. Memorial contributions may be made to the Syracuse Fire Department or the Calvary United Methodist Church.